Yes, we did it! 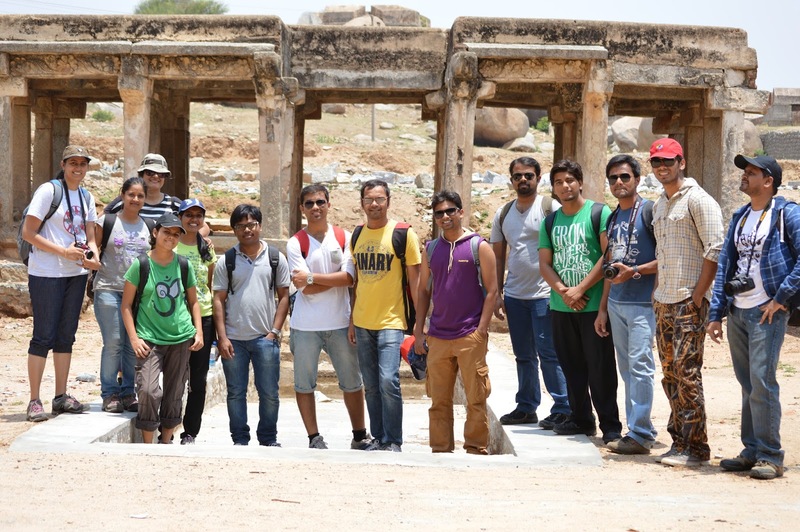 On the 24th of May 2014, 16 of us scaled Madhugiri. From the accounts of the veterans at BTC it is quite evident that this is frequently visited Durga. Antony, our leader had scaled the hill 5 times already! But, for the remaining 15 of us, this was a first. And within that there were a few for whom this was the 1st trek with BTC! For a trek that was marked with a difficulty of moderate to high, it was completely deceptive, for us there was nothing moderate about it. If our aches and pains are any testament then this was surely a high difficulty trek. Probably, that is why having successfully completed it is all the more rewarding. So, this is how it went. 16 BTCians meet up at Majestic at 6:30 am, well at least most of us :). Our leader and organizer Antony is on edge, KSRTC has changed the boarding point of the bus. The group is scattered but a few phone calls later we find each other and board the KSRTC to Madhugiri at 7am. Once you get to the state highway, the route is scenic, green and beautiful. Roopa my bus partner surprises us with her knife skills, She splits open a pomegranate with ease, and without any mess. Something, I sure cannot do. 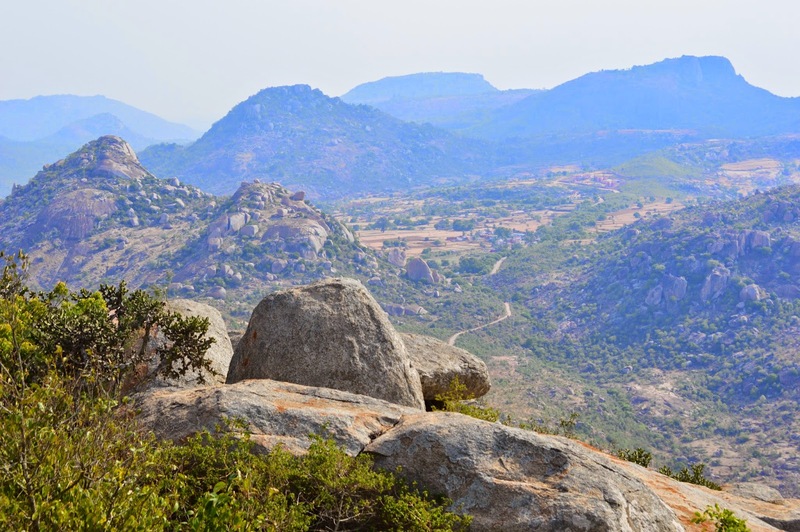 The journey gives us an opportunity to get to know our bus partners and we happily reach Madhugiri bus stand by 10:30am. Antony rounds up his pack for an introduction and photo session, and believe it or not gets us to do sit-ups! Does that remind anyone of their seventh grade PT teacher?! 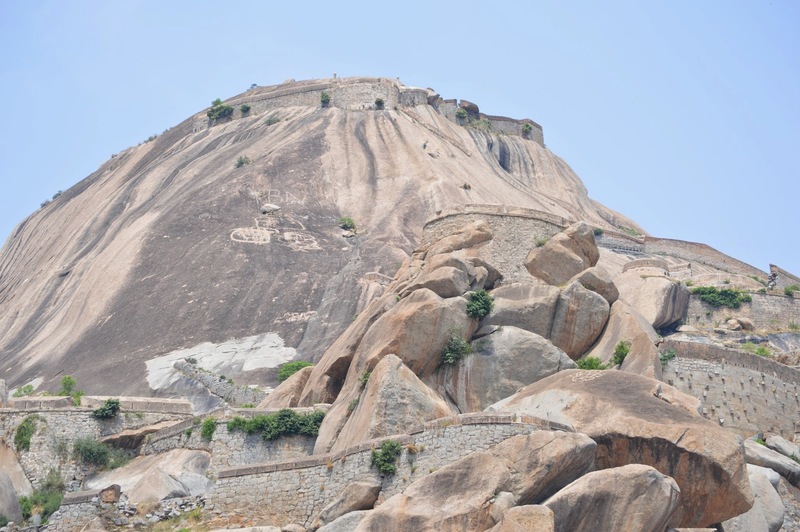 You can see the Madhugiri monolith and the fort atop the hill from the bus stand itself. And the realization of ‘what have you gotten yourself into’ dawns on you. With our bellies filled with breakfast at a local restaurant, we are on our way up the hill. We had only just started when 4 of us, Akash, Lohit, Roopa and I decide to tread a different path to make it just a little more adventurous. And adventurous it was. From the distance, while we are huffing and puffing for breath, we could see Sree leading the group and scaling the hill with enviable ease. The hill is gorgeous! It is full of surprises and its twists and turns are deceptive. Looking up you feel that once you make it to the man made fort structure you see, you are done! Its only once you reach what you saw do you realize that there is so much more to go. Each milestone opens up a whole new view of the horizon. Each new fort gate provides you with much needed shelter. Here the stone floor is cool and the breeze welcoming, just enough to gear you up for the trek till the next stop. A few of us are slower than the others and Roopa is the angel that stays behind and ensures no one is left behind. One could only imagine how the kings and queens of yore and their subjects climbed up and down this steep hill. More importantly how did they construct this stone edifice atop a huge monolith as this! With the general chit-chat that ensued, the idea formed that this was the perfect spot for a night trek. Apparently one has been done before. It will certainly save us from the relentless heat of a day trek. With promises of one being organized soon on a full moon day, we began a 2nd round of exploration of the ruins around us. After our tryst with history it was time to start our descent to reality. The descent though much faster was no mean feat. As is with any trek while treading downhill one has to be just a little more careful. Only saving grace is that now gravity is on your side. It was now evening and the vistas around us were a beautiful orange hue. Wonderfully exhausted we reach the foothill by 5:30pm. It is now hard to believe that this was the awkward group of 16 strangers that started their journey just the same morning. Our organizer and leader Antony, surprised and treated us with to ice-cream each! We had completed a trek. One that, some of us (including me), thought was impossible for us to do. But we did it just the same. And the aches and pains will be with us for a few more days to remind us of what we have achieved. Am I crazy enough to do this all over again? And the answer would be a resounding ‘Yes!! !’.